The original story of Peter Pan, Wendy Darling, Captain Hook, and Tinker Bell is in the public domain in most of the world, having been published by creator J. M. Barrie in novel form in 1911. 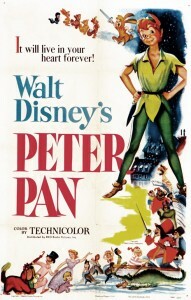 Under PD56, Walt Disney’s animated musical adaptation – released in theatres in 1953 – would have entered the Public Domain at the end of 2009. This entry was posted in 1950s, Movies, Music. Bookmark the permalink.